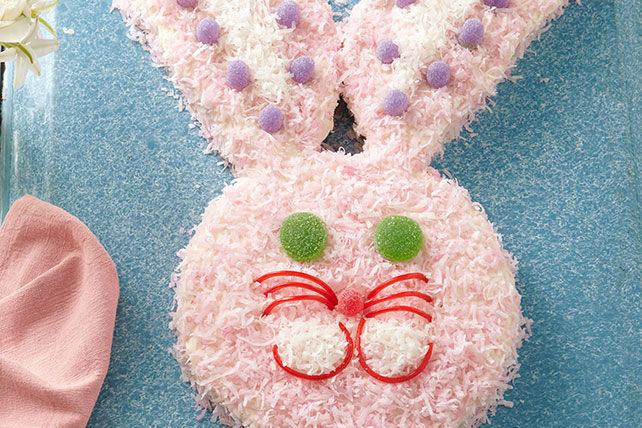 Hunting for the perfect Easter dessert? Our Hip-Hop Bunny Cake, made with carrot cake and cream cheese frosting, is a splendid addition to your Easter celebration. Perfect for birthdays too! Cut 1 cake layer as shown in Diagram 1. Arrange cakes on tray or large platter as shown in Diagram 2. Beat cream cheese spread, butter, sugar and vanilla with mixer until blended; frost cake. Reserve 1/4 cup coconut. Mix food colouring and water; toss with remaining coconut until evenly tinted. Sprinkle over cake. Add reserved coconut for the cheeks and inner ears. Add decorations to resemble photo. This seasonal crowd-pleasing cake makes a great addition to any holiday party. Prepare using your favourite flavour of cake mix.